Spring sprung with gusto this March, and the K-pop comeback calendar was in full bloom. New rookie groups like TXT debuted with youthful energy and sweet spring colors. Seasoned artists also showed new hues of their talents, with Sunmi starring in the visually captivating MV for her latest song “Noir” and DIA delivering their most electrifying single yet with the delightful disco-pop of “Woowa.” Other established artists, such as Epik High, changed labels, allowing them to explore different aspects of their artistry. Like flowers bursting forth following a harsh winter, many of this month’s Unsung Artists have endured personal and professional trials. Not only have they pushed through them, but they’ve also managed to turn their experiences into something beautiful. 2019 might be the era of the female soloist, but ahead of his military service, Shinee’s Key has been dazzling with his solo releases. It’s hard to believe he only made his solo debut back in November 2018. The song has an irresistible, bouncy brightness that’s wonderful to see from Key after Shinee’s many hardships over the past few years, including the death of their group member and friend Jonghyun. The members are continuing to create music, but their fifth member is still in their hearts. Fans can hear “bling bling” among Soyeon’s ad-libs at the beginning of the song, a subtle nod to Jonghyun’s nickname among Shawols. After parting ways with her former label Happy Face Entertainment, Subin of underrated, inactive girl group Dal Shabet reemerged as DALsooobin. Her new eccentrically styled stage name fits her new quirky, creative sound. “Katchup” is an ode to an ex who broke things off because DALsooobin was too much of a child. And much like a teenager whose moods fluctuate wildly, DALsooobin shifts between smugly asserting that she will “catch up” with her former beau and petulantly squirting ketchup on a figurine representing him. “Katchup,” which she wrote and composed, showcases her breathy, low voice and experiments with structure and instrumentation in surprising ways. The track seems to melt and warp ahead of the chorus before unexpectedly dropping out. And then comes the intense retro robotic dance break climax. The staccato choreography matches well with the off-beat attitude of the track. Much like the MV’s visuals, the song itself might be off-putting to some but is ultimately mesmerizing. The song is a ride worth taking because you can’t tell exactly where you’ll end up. Though “What You Waiting For” has driving beats and a one-phrase chorus in common with R.Tee’s previous songs, the track is dirtier and edgier thanks to the muffling and distortion of the beat-drop chorus. Anda’s strong voice is able to sell the dramatic pre-chorus build-ups and add emotion to a dance club jam. In the MV, her charisma travels through the camera as she hits the song’s key point choreo. Hopefully Anda’s career isn’t sidelined again by forces beyond her control. One of her allies, R.Tee, is enlisting in the military soon, while her YGX CEO Seungri is embroiled in a massive scandal that threatens to eclipse not just her release but anything else in the works at YG. Multinational girl group GWSN, also known as Girls in the Park, made their first comeback on March 13 after the breakout success of their dreamy debut “Puzzle Moon.” “Pinky Star (Run)” doesn’t deviate too far from the formula of “Puzzle Moon,” utilizing tutting and hand formations in the choreography, referencing the group’s mystical powers in the MV, and creating contrast between bright, chirpy vocals and deep house synths on the track. Although vocalist Seokyoung came in 30th on Produce 101, the group’s buzziest member might be Japanese member Miya, whose captivating, androgynous visuals had people asking, “Who is she?” in “Puzzle Moon” — even though she had no lines in the song. 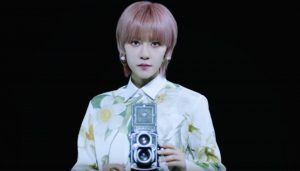 Miya embodies the contrast in GWSN that makes the group stand out in a sea of other rookies with cosmic mythologies. Her lower tone rap and “run” line introducing the song’s dance break add a cool girl factor that balances the song’s cutesier moments. This is similar to the way the bass of the chorus anchors the track, giving it depth beyond being sugary pop. With f(x) and androgynous K-pop icon Amber currently inactive, GWSN could fill a void in the K-pop landscape if they hone in on a cool, chic aesthetic. Like a phoenix rising, Park Bom emerged from K-pop purgatory this March with her triumphant, theatrical track “Spring.” Formerly of YG and 2NE1, Bom was shuttered away from the spotlight following her 2014 drug smuggling scandal, which also sidelined her group before their sudden disbandment in 2016 in which Bom did not renew her contract. Will spring ever come to me again? Will a beautiful flower ever bloom in my heart? Will it be spring again in my heart? The theme of beauty from the ashes is apparent with the contrast between the MV’s romantic florals, flowing chiffon fabrics and flourishing dance formations and the barren warehouse setting with a chandelier smashed on the ground. Bom is shown wearing a black veil surrounded by barriers trying to hold her in. But once outside of them, she’s robed in white with a glittering crown. Bom has not-so-subtly announced: The queen is back. Bom’s voice is backed by a choir and echoing effects, creating the sense she’s performing in a grandiose concert hall. The chorus builds to a dramatic climax that shows off her soaring voice. This song’s rap is a well-incorporated and powerful moment as Bom’s former 2NE1 member Dara delivers an emotional, spitfire verse. While some other former second-generation girl group members are struggling to find their voice in the industry, Bom has nailed her pop diva sound. In March 2018, long-running group 100% were devastated by the sudden death of their leader Minwoo. Overcoming this tragedy has been one of the group’s many hardships, including various lineup changes and competing on survival show The Unit to try and prove their talents. Now down to just four members, 100% are still making catchy music, and their latest release “Still Loving You” is no exception. As a group, 100% has strong vocals and a quiet, mature confidence which shines through even the simplest MV. They don’t have to dazzle with effects, exhausting dance routines or gimmicky concepts. The mid-tempo retro song, fittingly off their sixth mini-album RE:tro, is driven by a Latin cowbell percussion beat and punctuated by dynamic horns, a whistling effect and Rockhyun’s rhythmic delivery of the first half of the chorus. Other note-worthy elements are the partner-dancing choreography key point and the melancholy ending of the song with a low-tone rap. While the MV and song are lacking the dynamism and drama of one of their stronger comebacks “Better Day,” “Still Loving You” returns the group to a retro sound that suits them so well and is a heartening sign to fans that they’re persevering in a fickle industry. Everglow, the new girl group from China-based Yuehua Entertainment, which co-manages WJSN, burst on the scene on March 18 with their debut track “Bon Bon Chocolat,” and boy is the result sweet. The MV is plotless, but the six members serve fabulous face to the camera and send shockwaves of energy through the screen when they hit the chorus’s signature sultry movements. The choreography was created by 1Million Dance Studio’s Lia Kim, who also did Sunmi’s “Gashina” and Twice’s “TT” among others. In a behind-the-scenes interview, Kim said made the dance specifically to highlight the member’s powerful facial expressions. The smooth hand moves allow the girls to exude attitude. The girls of Everglow are so polished upon debut in part because they put in the work to hone their skills and gain fans on reality shows. Member Onda appeared on Idol School. Sihyeon and Yiren appeared on Produce 48, after Sihyeon already went through the ringer on Produce 101. Everglow also literally stand above the rest: Aisha is touted as one of the tallest female K-pop idols at 174 centimeters, or about 5’8”. With their captivating performance skills, clear identity and memorable members, Everglow are poised to make their mark in K-pop. While March saw plenty of much-hyped debuts, one boy group’s debut on March 27 flew under the radar. 1Team, the first boy group from Liveworks Company, is a new five-member group whose members BC and Rubin competed on the survival shows Boys24 and Mixnine. Rubin made the cut for the final boy group on Mixnine whose promised debut was then flubbed by YG. The cool tone of the song, its repetitive nature and the bright pastel colors do indeed create a vibe of a breezy spring afternoon. Unfortunately, these fashions and sets have been utilized by other boy groups before, so nothing in the MV feels innovative or commanding of attention. Nevertheless, “Vibe” has an effortless charm and high replayability. Who do you think was the biggest under-appeciated artist of March 2019? Sound off in the comments! A Chicago-based writer. My life is hamburger.